Do cage-free eggs make up for mono and diglycerides in your baked goods? 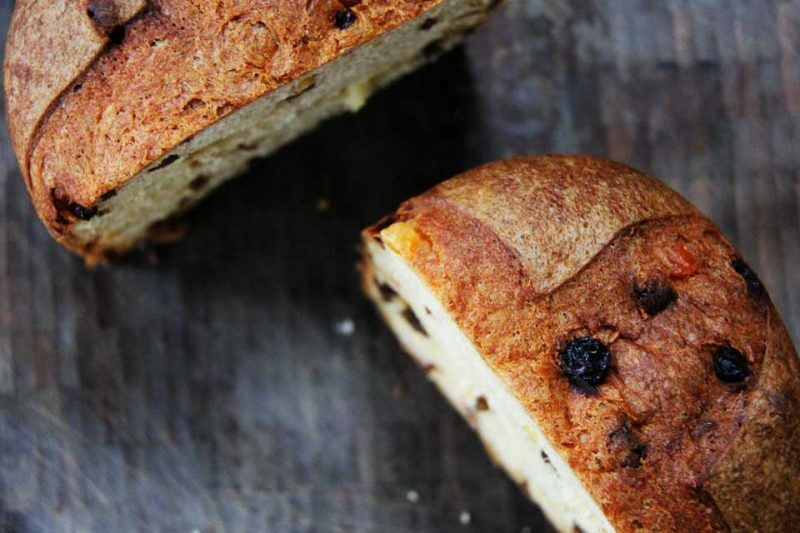 Panettone is a Milanese specialty that’s enjoyed throughout Italy as a Christmas treat. Making it takes a long time, and it’s expensive, since it’s enriched with egg yolks and butter. Needless to say, the resulting tall, round and flavorful bread is well worth the effort. Especially since it is so very hard to find store-bought panettone in the US that isn’t made with industrial ingredients. I won’t name names, but I offer for your consideration a panettone for sale at the dominant green supermarket chain in the US. It’s even branded with their label. The packaging virtuously proclaims this panettone is made with creamery butter and cage-free eggs. Sounds good, what does it mean? Creamery butter: I searched for some reason why creamery butter would be better than some other kind of butter, but I couldn’t find anything conclusive. So while it sounds good on packaging, I’m not convinced that it actually means anything. I suspect it is more vague marketing speak. Cage-free eggs: Battery cages have been banned in the EU, but Italy has defied these bans and continues to allow this brutal practice. So cage-free eggs are definitely better, but as ethical, healthy eggs go, it’s a very, very low bar. Read the actual label. Are there ingredients that you don’t keep in your pantry? Your mom and grandmother didn’t cook with these, and no real people do. In fact, I’m not sure where I would go to buy some mono and diglycerides, just in case I wanted to bake with them…a chemistry supplier? So, what’s wrong with industrial ingredients? If they are not explicitly harmful, who cares? We’ve been cooking for many generations and somehow we’ve made out just fine without using mono-glycerides, fructose and the completely ambiguous natural flavors in our home kitchens. A label should resemble an ingredient list for a recipe. For instance, if you pick up store bought mac and cheese, it should be made out of the same things the home made version is made of. If not, you have to wonder why. Usually it comes down to money. The processed, industrial mac and cheese can be made cheaper with non-food ingredients. Throw in some preservatives and it will remain in stasis (which is not the same as being fresh) for longer. Or fake flavors and colors are being used to make an otherwise cheap and tasteless product appealing to you. Any way you look at it, you lose. The art of cooking is combining food or cooking it in certain ways to coax out delicious flavors. The art of food processing is taking the cheapest, lowest quality ingredients and making them taste like something with added flavorings, ultra potent sweeteners and making the food last forever with preservatives. Cooking food and food processing are not remotely the same. What is real panettone made out of ? Don’t accept industrial ingredients in your food products. If it’s not something you would cook with in your own kitchen, it probably doesn’t belong in your food or your body. If industrial additives were so great, we’d all be baking with mono and diglycerides. But they aren’t and we’re not.